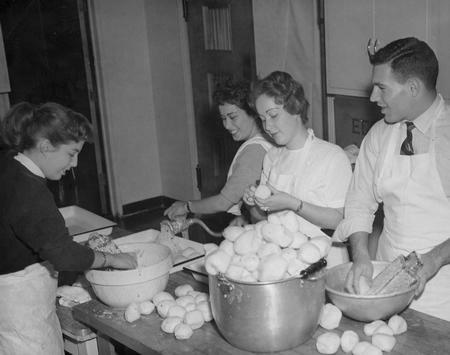 Jewish students who were members of the B'Nai B'Rith Hillel Foundation at Ohio State University making latkes (potato pancakes) for Chanukah, 1957. In 1925, the B'nai B'rith-Hillel Foundation formed. A Jewish organization, also known as just the Hillel Foundation, this group sponsors social, religious, and cultural activities for college students. Individual B'nai B'rith-Hillel Foundation chapters implement programs to educate both Jewish and non-Jewish students on Judaism and provide Jewish students with the chance to develop friendships and support systems. The first B'nai B'rith-Hillel Foundation student group formed in 1923 on the campus of the University of Illinois, and due to this group's success the B'nai B'rith-Hillel Foundation came into existence. Most major Ohio colleges and universities have a Hillel organization on their campuses.